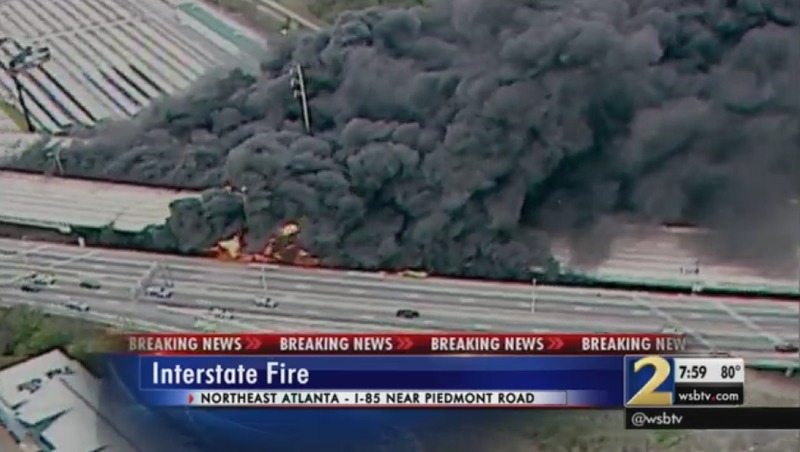 A massive fire that broke out underneath Interstate 85 in midtown Atlanta, Georgia during rush hour caused a section of the roadway to collapse. No injuries have been reported. Traffic was quickly shut down after massive flames deteriorated the stability of an overpass in midtown Atlanta, leading to a hefty chunk of I-85 falling onto the street below. It’s currently unclear what started the “heavy fire” under the overpass. Both directions of I-85 will be shut down indefinitely until the cause of the fire and the structural integrity of the remaining sections of the overpass are determined, and obviously while the giant hunk of roadway is replaced. Local authorities and planners are reportedly currently meeting to determine a plan of action for how to direct the thousands of commuters that rely on the I-85 artery in midtown Atlanta while it’s repaired. A chunk of I-85 collapsed during rush hour and there are no reported injuries. That’s amazing. Update, 7:48 pm: Reports are claiming specialized foam-spraying firetrucks from the airport are now on the scene, which are meant to deal with plane crashes and fuel fires.